Walking into the Reed Opera House in downtown Salem is like stepping into a different time. Walking into the street-level of the building, you are surrounded by different cultures and artistic expressions – and that’s the way building owner Roger Yost wants to keep it. The similarities don’t just stop with the owners, the historic opera house was once the site of Susan B. Anthony speech, and during the 2008 presidential campaign, then candidate Hillary Clinton also spoke – and had a cannoli from one of the many shops. “When she was coming through town we hoped we could get her here and she came in and even went to the ballroom, it was wonderful,” Maitland said. When walking in from the Court Street entrance, there is a display that shows the lengthy history of the opera house and mall. Many of the meeting rooms and hallways are surrounded in the mystique of the old opera house. Reed Opera House in SalemHistory aside – and there is plenty of history to learn about the building – the mall is becoming one of the creative centers for Salem. The mezzanine area is filled with the smells of the many restaurants and bakeries, and is the perfect place to sit and read, use a laptop or draw. Even during the tough economic times of 2010, the retail space was 100 percent full, something that can’t be said for many malls around the country. Maitland thinks that because of the history, location, and environment of the opera house, it continues to be a vibrant commercial center for Salem. From murals and paintings all around the building – the elevator doors are even painted with old fashioned movie posters -- the gallery in opera house stays busy and is also a great place to watch artists work. If that was all there was to see at the Reed Opera House, that would be enough, but in addition to the food, shops, art, and history there are also regular events including music, plays and speeches. Before you visit the building at the corner of Court and Liberty street, check the calendar and you can even call ahead. 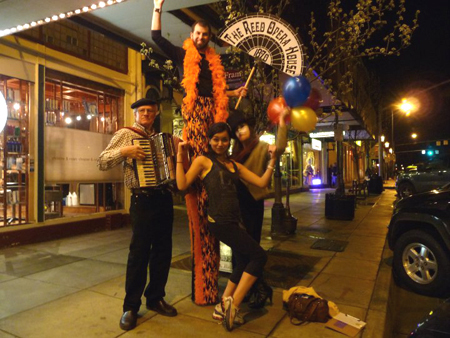 About the Reed Opera House: Located in the center of downtown Salem at Court and Liberty streets, this historic building is a shopping center, a home for several cafes and restaurants and hosts many community gatherings in its conference rooms. What to bring: From a big appetite to an interest in local art, the Reed Opera House will keep you busy for an entire day exploring each floor and nook and cranny. Season: The opera house is open year round. Tips: If you call ahead, staff at the opera house can give tours, and even point you to other attractions in the Salem downtown area. History: The Reed Opera House was constructed from 1869 to 1870 and originally was intended to be the Oregon State Legislature, the Oregon Supreme Court and Oregon Library. When state leaders of a new administration changed their minds about the plans, Cyrus Adams Reed, owner, had architect G.W. Rhodes include seven shops on the ground floor, an opera house in the center of the building and hotel rooms on the second and third floors. Since then many famous people have visited the building and it has been going through a renaissance since 2003 when it was purchased by Roger Yost.